Not only is food blogging fun, but also does help me acquaint with many wonderful people with the same mind, same taste and same passion with foods. I met Janet on twitter and started to read her food blog, gourmettraveller88, regularly a few months ago. You can’t imagine how wonderful I feel, when I get to know a food blogger who came from the same home country, Hong Kong. We love the same old-fashioned and modern fusion Hong Kong cuisine. Janet is now living in Basel, Switzerland with her husband and a new-born baby. Before she gave birth to her lovely son, Marc, her husband gave her a lovely present, helping her to publish her own cookbook, “Gourmet Traveller 88”. I’m so glad that Janet sent me a complimentary copy. 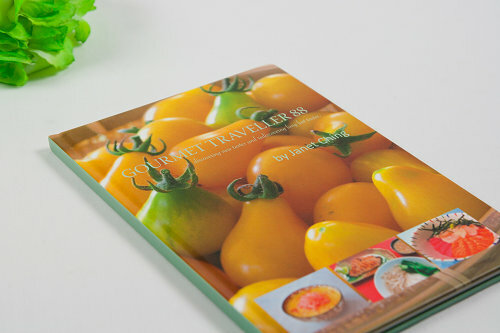 In Janet’s cookbook, there are 7 sections, Chinese, Indian, Japanese, Korean, Thai, Vietnamese and Western, all recipes in each section were carefully chosen by Janet and her husband through months. I love Janet’s cooking passions, and feel she has her own style in creating dishes with simplicity, with creative ideas of whipping up her favourite dishes of different countries. Take this warm handful chicken salad as an example, Janet really knows how to tweak the dressing to go with the chicken and fresh veggies, that tastes very similar to the one that Japanese cold noodle salad often used. With the chicken you saved from your chicken stock, hand pull the chicken meat into pieces, the texture by hand pull method is better than cutting with a knife !!! Prepare the sesame sauce by mixing the above in a bowl and set aside. Stir fry the green peas with a little olive oil for a minute or so and repeat the same for the cucumbers. Let all cooked vegetables cool to room temperature. 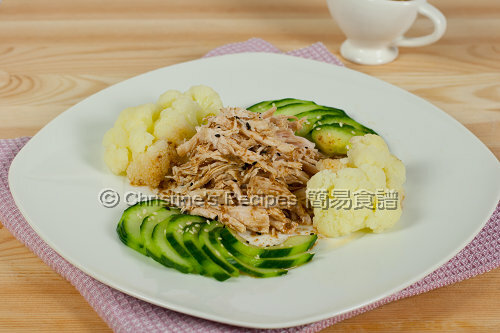 Arrange the vegetables on a big round serving plate and the hand pulled chicken in the middle. 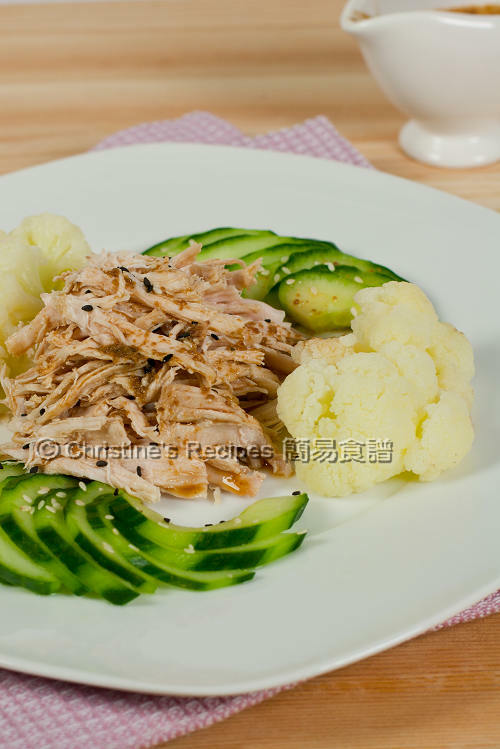 Garnish with some ground sesames and serve with the sesame dressing. this salad is light and delicious. A delicious chicken salad I can make for my daughter! She will love it! I have had similar Sesame Salad dressing for my noodles...did you get a good Chinese sesame paste/tahini in the end? I did not manage to find out about the brand I used as the bottle was already gone! I make this salad with a small amount of crushed sichuan pepper as well as torn glass noodles sheets for texture (fun pei). Great for summer! A great recipe from Janet's book! This chicken salad looks so delicious! Nice gift from fellow blogger as well! Wow, this sounds amazing and what a lovely cookbook and gift to us to introduce us to another wonderful blogger. I believe it is an honor to receive a copy from the author, isn't it? Excited for Janet and I love this handpulled chicken, warm or cold : ).